Rose Gold seems to be everywhere these days. I’ll be the first to admit, I was not a fan originally. But as with most things that I say “I don’t like that at all”, Rose Gold has grown on me. My kitchen is not a glam & glitz kitchen. My kitchen is farm house and galvanized metal and wood and a rustic family kitchen. 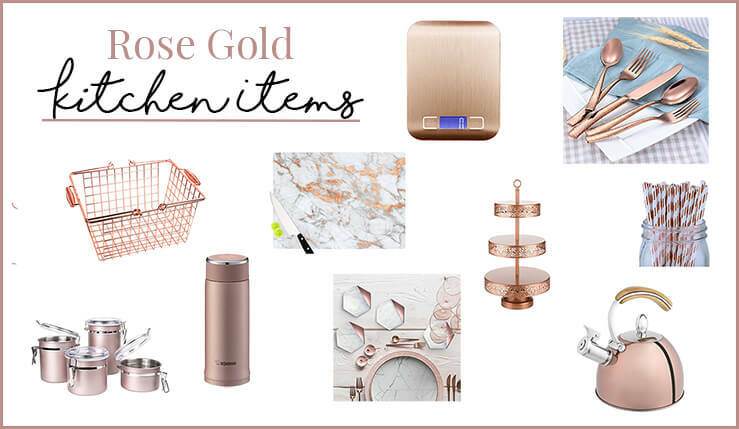 But I do have to admit, these Rose Gold Kitchen Items do make me swoon. 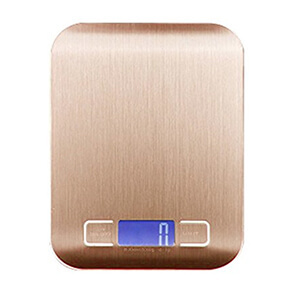 Portable, Stainless Steel, Digital Kitchen Scale in Rose Gold. If you are a cook that likes to measure out ingredients down to the gram then this Rose Gold Digital Kitchen Scale might be just what you (or someone you know!) needs. 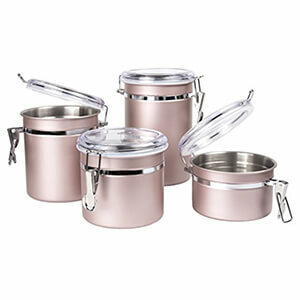 Now, how adorable are these Rose Gold Stainless Steel Canisters?! See-thru locking lids. These are awesome and adorable and a great, cute, storage solution. 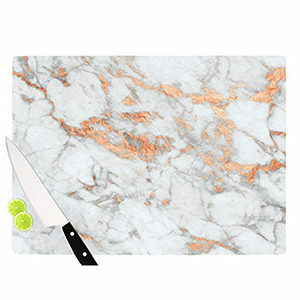 How about this marble look cutting board with rose gold flakes? This is gorgeous! 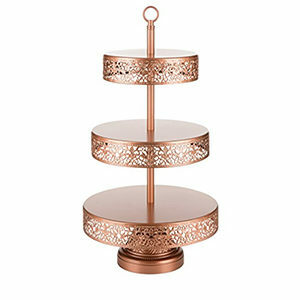 This piece makes me want to add some rose gold in my farmhouse kitchen. Not quite sure that would work though. 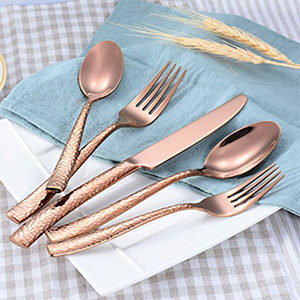 20 piece Rose Gold Flatware set. Shiny rose gold mirror polish. Great texture, perfect for everyday use or for special occasions! 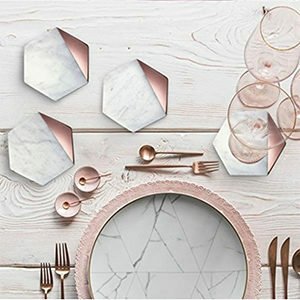 Hexagon Marble Rose Gold Coasters. 4 inches in diameter, felt backing so they won’t scratch any surface. These are so pretty and elegant! Shopping for a tea drinker who loves rose gold? 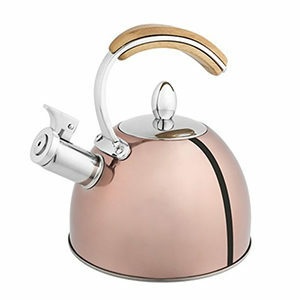 This Presley Tea Kettle in Rose Gold is just the thing! Holds 70 ounces and whistles when the water is hot. Are you hosting a party for any occasion? 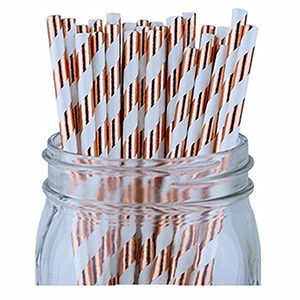 Dress it up with these adorable striped straws in white and rose gold. GORGEOUS! 100 pieces. 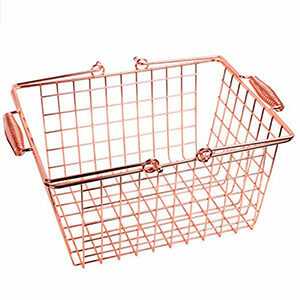 Rose Gold plated Wire Basket. This would be great for pantry organization, a pretty display in the kitchen or dining room or a party. 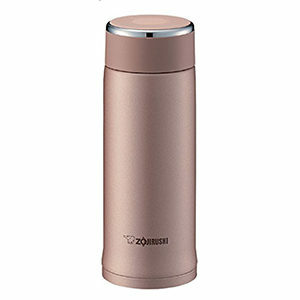 Take your coffee, tea, or drink of choice with you where ever you go with this Rose Gold Stainless travel mug. 12 or 16 oz. What is your favorite item? Do you know anyone who loves Rose Gold? Pinning and sharing is so appreciated, more views helps support me so I can keep bringing you more delicious recipes and fun DIY projects! !